NJ HORSEPLAYER: Maidens: Mayday! Mayday! The annual pilgrimage to Saratoga was its usual great social experience (outside of having a betting ticket more or less stolen from me at the window), but frustrating from a handicapping perspective, particularly in light of the abundance of maiden races on Sunday's 10-race card. Emboldened a bit by the July 25 Night School web chat on handicapping two-year-old horses at Horse Player Now, I wanted to give the early Pick 4 a try. The sequence featured four consecutive maiden races (though not all with two-year-old runners), and on my $12 ticket (50-cent base wager) I hit the second (3-to-2 favorite Queens or Better) and third (6-to-1 Professor Fate) legs but missed on enormous prices in legs one and four; the Pick 4 ultimately paid nearly $27k, implying a difficult sequence. The final leg, Race 5, came into focus. Spending the day with Grandpa NJ Horseplayer, Red Rock or Bust and three other friends, I posed a question to my amigos about the rail horse, Margo Verge, a three-year-old filly trained by Bruce Levine who posted a decent third-place in her first start in late March and a lackluster fifth in her second start in late May; both maiden claimer dirt sprints. I was intrigued by the 8-to-1 morning line on Margo Verge on the first-time claim trainer angle (22% in 123 starts) along with the drop from $50k to $25k company and first-time turf, but unsure what to make of the second-consecutive two-month break between races, plus the lack of published workout in four weeks; the last being July 3 at 3f in a breezy 37 seconds (second best of six). Was this horse sound heading into the race? These are the questions that most of us on the outside surely cannot answer, and along with the jockey angle (I never seem to score with Alan Garcia, who was 0-for-25 on the meet to that point), and some supportive insights from Red Rock's handicapping consultant and Bloomberg writer Dave P., I left Margo Verge off my ticket. The decision never cost me since I was out after the first leg, but we watched Margo Verge run a gutty second, a half-length behind 32-to-1 Unknown Wonder, ridden by J.L. Espinoza (who almost won later in the card on a 40-to-1 shot). 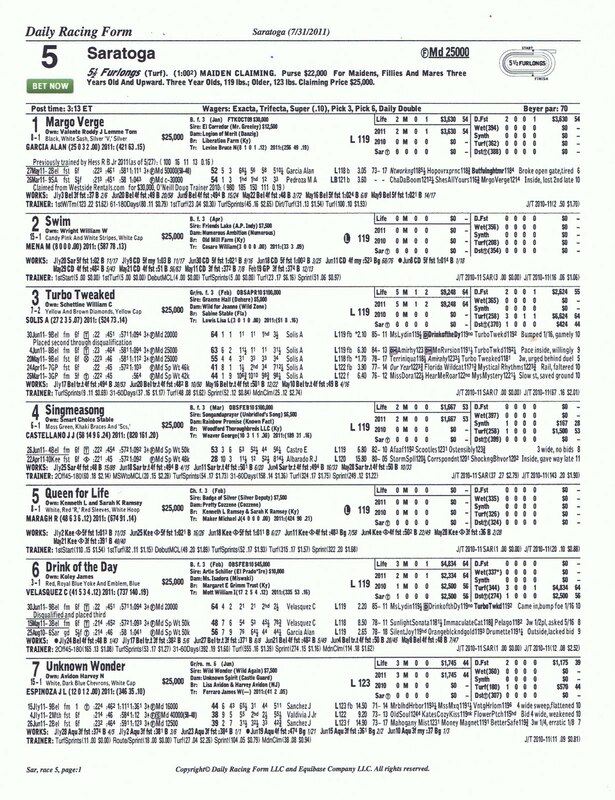 It got me wondering...what in the past performances suggested this horse (or the winner) would run so well? Why two lines between two starts? 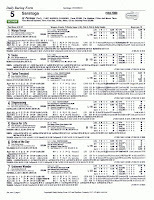 Can handicappers really glean any valuable insight in the work tab leading up to a maiden event? I clearly am lost for answers, so feel free to comment. Start planning next year's trip to the Spa ASAP. Well it looks like you got that RSS feed switch turned on. Sounds like you had a blast upstate. Now.. Need to experience Del Mar, but Saratoga hands down is the best place I know. I'm going to try to get to Keeneland in the fall when Rutgers plays Louisville in October, but we'll see; I'm sure that'll be really nice too. Funny, but it was turned on; I think I just disabled it, re-enabled it and saved. Thanks for looking into it, though, as you draw more traffic to your site then mine. Best of luck this weekend, wherever you're playing! I've got some new Ellis Park freebie online on Sunday and hope to move up from #202 in the Public Handicapper standings.